Harold Everett Greer (born June 26, 1936) is an American retired professional basketball player. Born in Huntington, West Virginia, he attended Douglass Junior and Senior High School in Huntington. He played college basketball at Marshall University and was drafted by the Syracuse Nationals of the NBA in 1958. Greer played for Syracuse for five seasons, raising his scoring average to 22.8 points a game in 1961. He was selected for the NBA All-Star team that year. 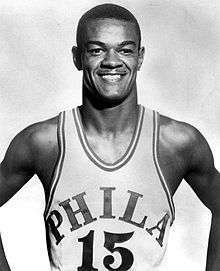 Hal Greer scored 21,586 points during his 15-season career, all with the 76ers franchise. In 1963, the Syracuse Nationals moved to Philadelphia to become the Philadelphia 76ers. There, Greer became well known as a teammate of Wilt Chamberlain, and starred on the powerful 1966–67 team that ended the eight-year championship reign of the Bill Russell-led Boston Celtics. In the 76ers' 15 playoff games that season, Greer averaged a team-best 27.7 points. Greer had an unusual but highly effective free throw technique, shooting a jump shot from the charity stripe. He is usually considered the third-best guard of the 1960s, behind Oscar Robertson and fellow West Virginia native Jerry West. 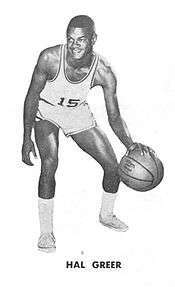 Greer played in 10 NBA All-Star Games and was the MVP of the 1968 game when he went 8-for-8 from the field and scored 21 points, a record-breaking 19 in one quarter. He also was chosen to the All-NBA Second Team seven times, and scored more than 20,000 points during his NBA career. His hometown has honored his success by renaming 16th Street, which carries West Virginia Route 10 as the main artery between the campus/downtown area and Interstate 64, as "Hal Greer Boulevard." Hal Greer is recognized as the only African-American athlete enshrined in a major sports hall of fame from West Virginia. In 1982, he was inducted into the Naismith Memorial Basketball Hall of Fame along with Slater Martin, Frank Ramsey, Willis Reed, coach Clarence Gaines, and contributor Alva Duer. Inducted into the Marshall University Athletics Hall of Fame for his career in basketball and baseball in 1985. Scored 21,586 career points (26th all-time), including 50 in one game vs. Boston Celtics; also leads all 76ers players in career points. A 1-and-a-half-mile stretch of road in Huntington, West Virginia, was renamed "Hal Greer Boulevard"
↑ Dr. Alan B. Gould (July 1985). "National Register of Historic Places Inventory Nomination Form: Douglass Junior and Senior High School" (PDF). State of West Virginia, West Virginia Division of Culture and History, Historic Preservation. Retrieved 2011-07-23.